If they don't get their assigned chores done each week, be ready with a combination of natural consequences for kids. Have natural consequences at the ready for kids who don't complete their chores. If you've given the kids age-appropriate chores and all you're getting is backtalk or non-compliance, it's time to take back control of the asylum from the inmates. Here are five ways to keep you from looking like the bad guy, and instead place the onus on the doer - or lack thereof - of the undone chores at hand. 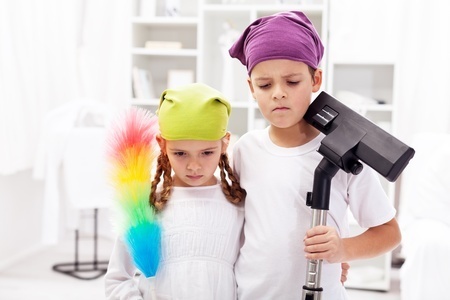 By having consequences for kids ready to implement as soon as the first chore is missed, they'll realize you're serious about the family housecleaning program. Give more chores to the rule-breaker whose duties aren't done; ditto for a child who keeps whining about her chores. Ground the child who refuses to do his chores for the morning or the afternoon. Take away his TV privileges for the weekend. Call it the "no work, no play" rule. Stand behind your rules - and your consequences for rule-breakers. The advantage to having rules is that you don't have to reinvent the wheel every day. There are no arguments. Simply say, "You know the rule, and you're in violation, buddy! No exceptions." This technique requires some restraint and patience. It means that you allow your child to make a mistake and wait for him to experience the natural consequence of that mistake. This technique is good for harmless things like putting off a chore for so long that a child has to miss a social event to complete the chore by its Saturday due date. If your children don't do their chores, or give you bad attitudes, it's wise to apply discipline but to keep your emotions in check. Avoid anger at all costs. It gives them a license to misbehave - and sends you tumbling back to square one.